Prime Minister Peter O’Neill will assume the chairmanship of the MSG and its constituent bodies on behalf of PNG. Last week, a team was in town to meet with PNG Foreign Affairs officials to finalise arrangements and preparations for the February 10-15 summit. The MSG countries comprise PNG, Vanuatu, Fiji, Solomon Islands and FLNKS Front de Liberation Nationale Kanak et Socialiste (FLNKS). Their leaders Fiji Prime Minister Frank Voreqe Bainimarama, the Solomon Islands Prime Minister Rick Houeniplwela, Vanuatu Prime Minister Sato Kilman and FLNKS leaders are expected to be in Port Moresby for the summit. 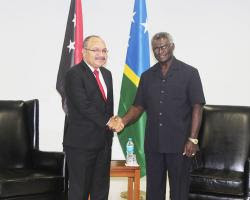 The director general of the Melanesian Spearhead Group secretariat Amena Yauvoli met with the Minister of Foreign Affairs Rimbink Pato, Acting Secretary of Foreign Affairs Barbara Age, Police Commissioner Gari Baki and other government officials. Ambassador Yauvoli reaffirmed the MSG Secretariat’s full commitment to provide the necessary support to assist PNG host a successful Leaders summit. Age emphasised the priority for PNG at this leaders’ summit was on sustainable development goals as outlined in the MSG 2038 Prosperity for all Plan.